There are many variations of the K-DCAN cables available on the market today, with varying price points and quality. Many of these cables are made using counterfit FTDI serial chips and may not work at all. Another major issue is basically all of the available cables on the market today have bugs in the DCAN firmware that will brick many modules when used on newer BMWs (especially where K-line is no longer used). A bricked module can be serious, especially as many (including the DME) cannot be recovered and often must be replaced, which is not usually cheap. We have partnered with BimmerGeeks to supply K+DCAN cables that solve both of these issues. They are all QC checked to ensure quality components and modified with upgraded firmware, which is verified to resolve the "bricking" issues on specific modules that cheaper D-CAN cables cause. The Pro-Cable is unlike any cable out there that you can purchase. While many other cables out there may be different in terms of the physical build, they are all the same in one department...firmware. We take our switched cables, pull out a custom built programmer & load a modified firmware to the cable chip. Its faster, safer & more stable. The next best thing to a full-blown ICOM. Recommended for all module flashing. 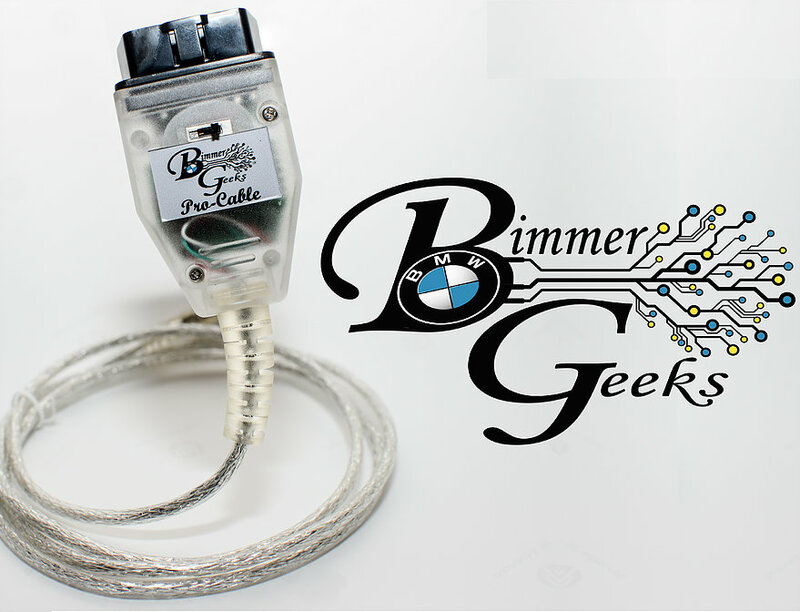 BimmerGeeks also offers help with remote coding and flashing - so if you aren't comfortable using WinKFP on your own for Bimmerlabs files, contact them at sales@bimmergeeks.net for help. Remote services are $40 (requires the a Pro-Cable and a PC). BimmerGeeks was a longtime lurker of the forums watching people get taken advantage of by companies charging insane amounts of money for remote services. After a while they took they're step forward & decided to offer a cheap alternative to the major players out there. Along with supplying cables, they cover remote software install, coding & flashing services & diagnostic help. Unlike the competition, its not all about money for them, they do they're best do help through messaging first, and only charge when a remote session becomes necessary.